What Day Of The Week Was January 7? 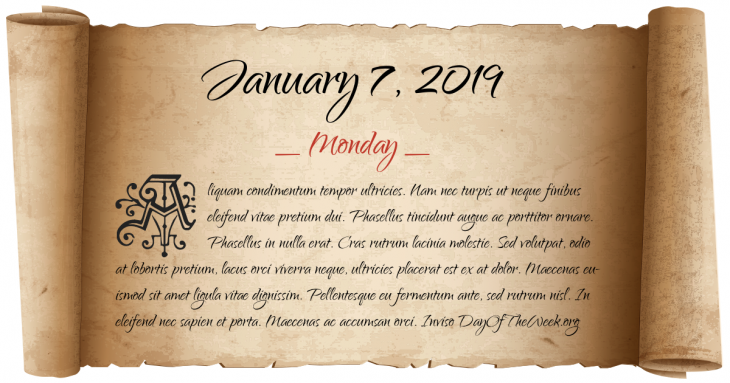 January 7, 2019 was the 7th day of the year 2019 in the Gregorian calendar. There were 358 days remaining until the end of the year. The day of the week was Monday. The first transatlantic telephone service is established – from New York, New York to London, England, United Kingdom. President Harry S. Truman announces that the United States has developed the hydrogen bomb. President Jimmy Carter authorizes legislation giving $1.5 billion in loans to bail out the Chrysler Corporation. Who were born on January 7?